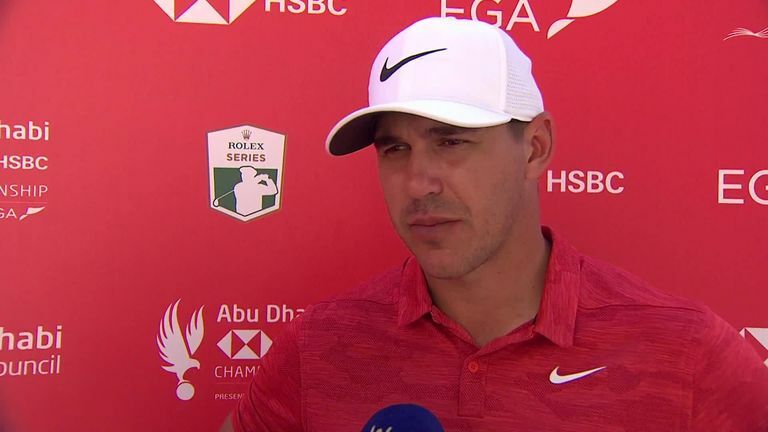 Brooks Koepka was happy to keep a bogey off his card while making five birdies in a 'very solid' 67 on the opening day of the Abu Dhabi HSBC Championship. Brooks Koepka insisted the Abu Dhabi HSBC Championship was comparable to a major after he opened with a confident five-under 67 on day one. Koepka enjoyed the "perfect" conditions on the first morning of the year on the European Tour and got under the card early with a birdie at the 11th - his second - before picking up three shots in four holes to conclude an impressive back-nine 32. The three-time major champion was less impressed with his performance over the outward half as he put together a run of seven pars which he broke with a birdie at the long eighth, and a closing par left him five strokes adrift of early pace-setter Shane Lowry. Koepka has little course knowledge having contested the tournament only once before, in 2014, and he said: "I remember it being pretty tight, tough golf course, and it kind of reminds me of a major championship. Like I've said all week, it's very demanding, and you need to be able to put the ball in the right positions if you want to score. "The wind is barely blowing, perfect weather, and the golf course is in great shape. These fairways are quite tight, if you hit it in the rough who knows what's going to happen? The rough is getting a little juicy, especially in the morning when it's a little wet. "It was a very solid round. I felt like I played well, struck it well, made those kind of key par putts coming down on the back nine. The front nine wasn't the best, it was a little sloppy, but I'll just clean it up for tomorrow." Koepka enjoyed a stellar 2018 in which he successfully defended his US Open title and then held off Tiger Woods to win the PGA Championship, but he admitted he needs to win more regular-season events to prove himself as one of the best players in the world despite coming into the week below only Justin Rose in the world rankings. "I just need to keep doing what I'm doing," he added. "I feel like my game is in a good spot, and I feel like if I can build on everything I did last year, I'll be just fine. You know, the majors are obviously very important, but I want to try to win a few more regular events and kind of establish myself as probably one of the better players." 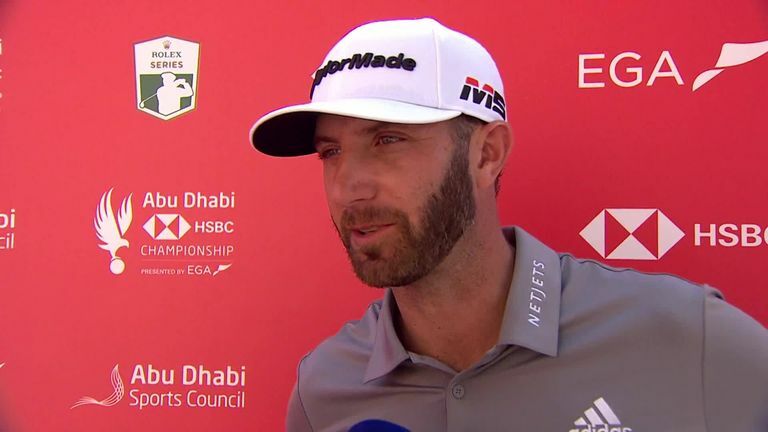 Dustin Johnson was delighted with his comeback from a poor start as four birdies over the last six holes salvaged a three-under 69 in Abu Dhabi. Koepka's Ryder Cup team-mate and world No 3, Dustin Johnson, was delighted to produce a strong finish to his first round as he salvaged a 69 having been one over and without a birdie after 10 holes. Johnson, who was runner-up to Tommy Fleetwood in Abu Dhabi in 2017 and was six shots adrift of the Englishman last year, also started at the 10th and dropped a shot at 13 before finally getting it back at the second. The former US Open champion slipped up again at the next, but he birdied the fourth and sixth before enjoying a birdie-birdie finish to ensure his lunch would taste far better. "I definitely struggled a little bit early, but I kind of got it together a little bit there on the back nine and hit some nice shots, holed a couple putts," he said. "Yeah, it was a struggle early but definitely hit it a lot better the last nine holes. "I just kept swinging, and I knew eventually it was going to start going where I was looking. I don't even know what was going on the first nine holes, it just was not going well. I was looking up, and the ball wasn't where I thought it was going to be."